One day, I was working in my office and had music playing in the background. I wasn’t really paying attention to the music, but at some point my mind shifted from the work on my desk to the lyrics of the song. And something unexpected happened. The words of the song hit a nerve. Some emotions came to the surface that I did not even know I was carrying. As I listened, the words of the song washed away those emotions. The lyrics reminded me that God loves me, and I guess I needed that more than I knew. For the rest of the day, my heart felt lighter. I kept thinking about that day. How all of us need moments like that, when God’s presence and God’s truth washes over us. And I thought about God sending the rain. How rain washes and cleanses, waters and nourishes. As rain refreshes the earth, so the Lord refreshes us. The Bible uses rain as a metaphor for God, as a picture of His truth and His presence and His spirit raining down on us. “As the rain and the snow come down from heaven, and do not return to it without watering the earth and making it bud and flourish, so that it yields seed for the sower and bread for the eater, so is my word that goes out from my mouth. It will not return to me empty, but will accomplish what I desire and achieve the purpose for which I sent it” (Isaiah 55:10-11). The earth needs rain, and so do we. We need His truth to rain down on us. We need His promises to rain down of us. We need His grace and His holiness to rain down on us. We need His loving presence to rain down on us. And here’s His promise. 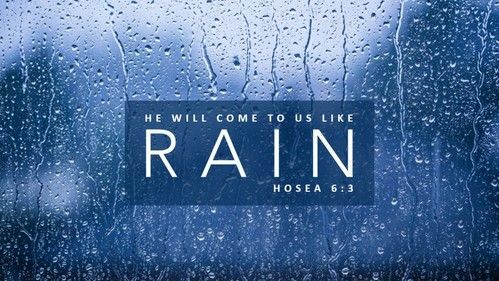 “Come, let us return to the Lord … let us press on to know the Lord … and He will come to us like the rain” (Hosea 6). As a new year begins, our prayer is that God would rain down on us. As rain refreshes the earth, so the Lord refreshes us.